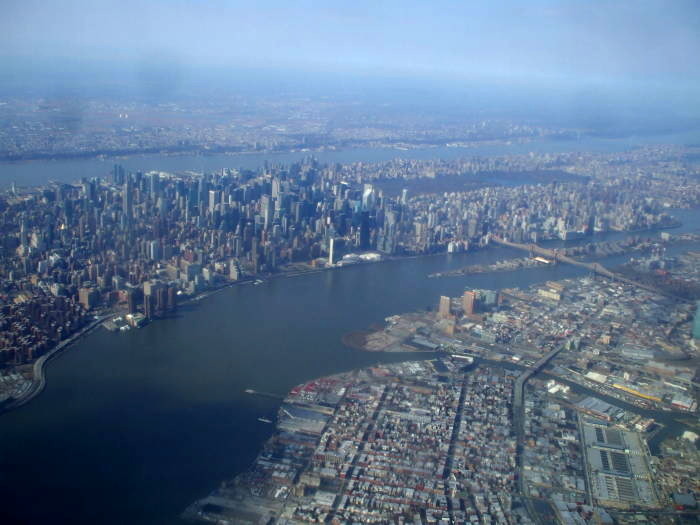 Let's fly into New York's LaGuardia Airport, with fantastic views of the harbor and all five boroughs of the city. LaGuardia or LGA is a very busy airport in crowded airspace. You have to guess in advance how to pick your seat. 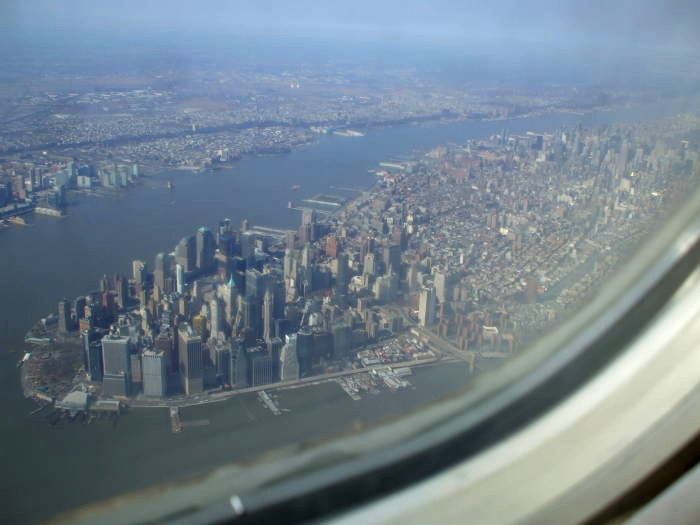 Ideally, you will have a left-hand window seat if you make the approach into Runway 04 from the southwest, seeing the harbor and Manhattan out your window. 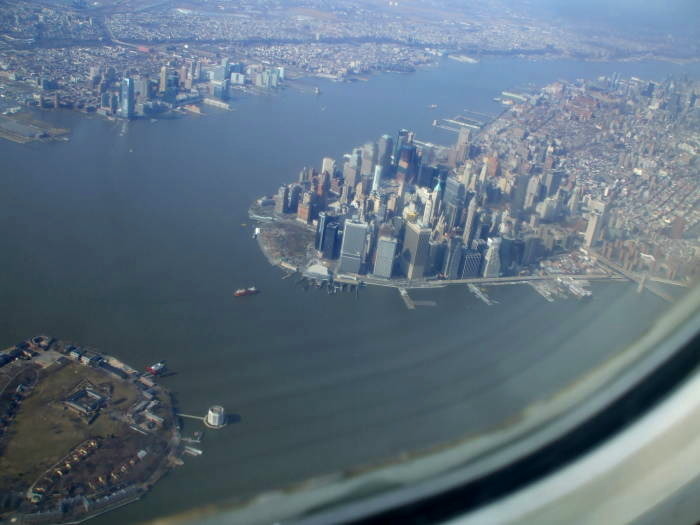 But, if you instead take the roundabout approach where you fly north up the Hudson River and then turn to land from the northwest or northeast, you will want to be on the right-hand side for views of Manhattan out that window. It's hard to predict well in advance, so just pick one. 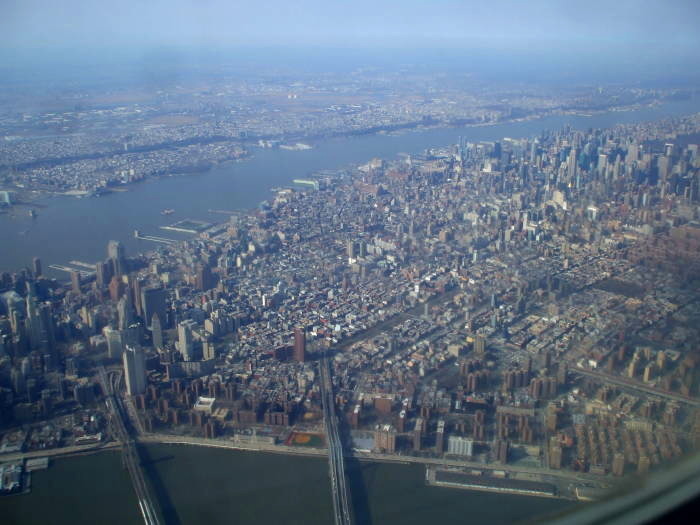 The three New York City metropolitan airports of LaGuardia, JFK, and Newark combine to form the largest airport system in the U.S. Teterboro in New Jersey handles a lot of business traffic, and there are heliports on both sides of Manhattan and elsewhere in the city. The combination is first in the world in terms of total flight operations, and second in the world in terms of passenger traffic (London Heathrow at 135 million, New York at 122 million, and Tokyo at 100 million). 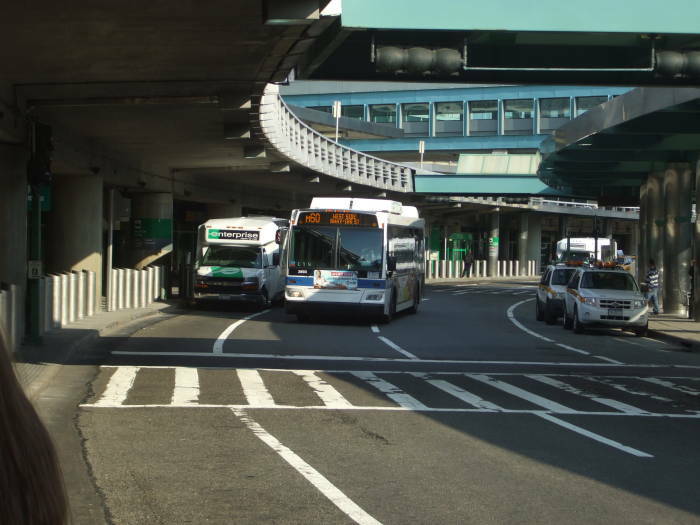 LaGuardia itself handled over 26 million passengers in 2013. 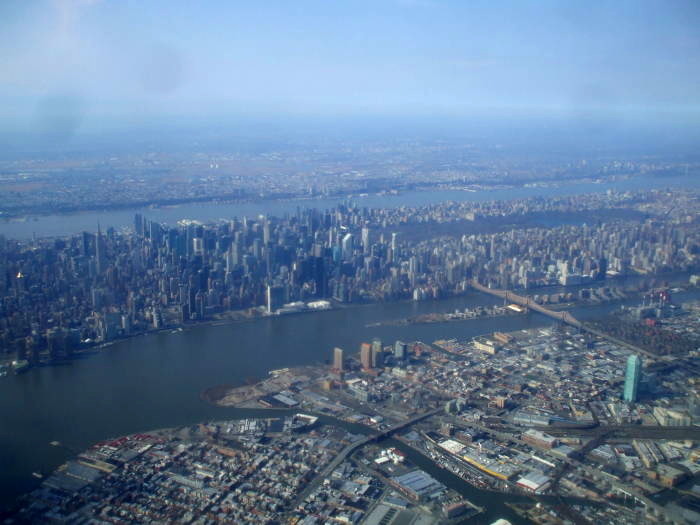 LaGuardia is the regional airport of the three. A regulation prohibits nonstop flights to or from points beyond 1,500 statue miles, with exceptions for flights on Saturdays and to and from Denver. The only international service is to and from Canada, with all border control done at the Canadian airports. Its location limits its modernization and expansion. Many pilots refer to it as the USS LaGuardia as it can seem like landing on a large aircraft carrier. 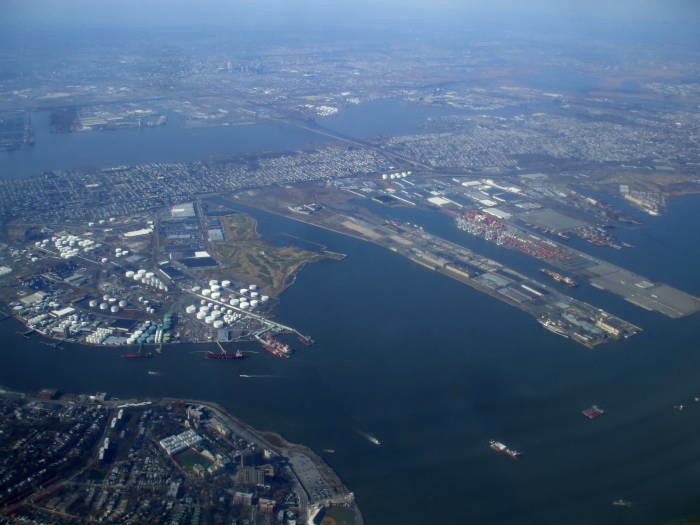 The runways are short, and both have been extended to their current 7,000 feet by moving landfill from nearby Rikers Island (formerly a garbage dump, now a prison) into metal frameworks extending into the surrounding waterways. Signs along the taxiways warn of the magnetic compass interference caused by the metal frameworks. 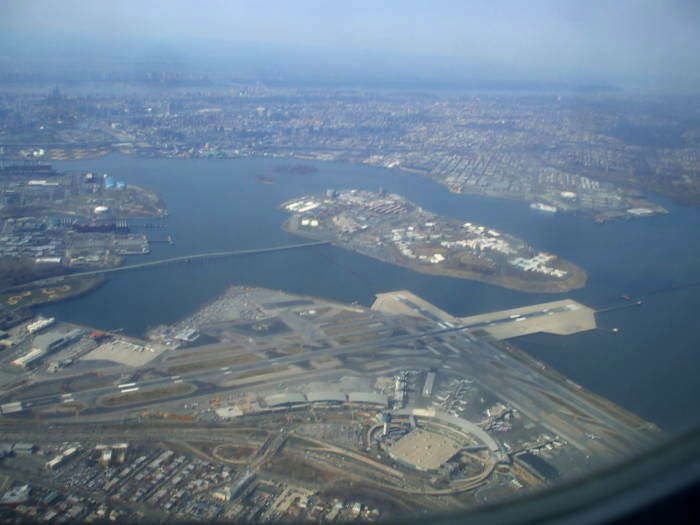 Here is a video of a daytime approach into LaGuardia runway 4, crossing over Staten Island and the outer harbor, Brooklyn, and Queens, with great views from a left-side window seat. 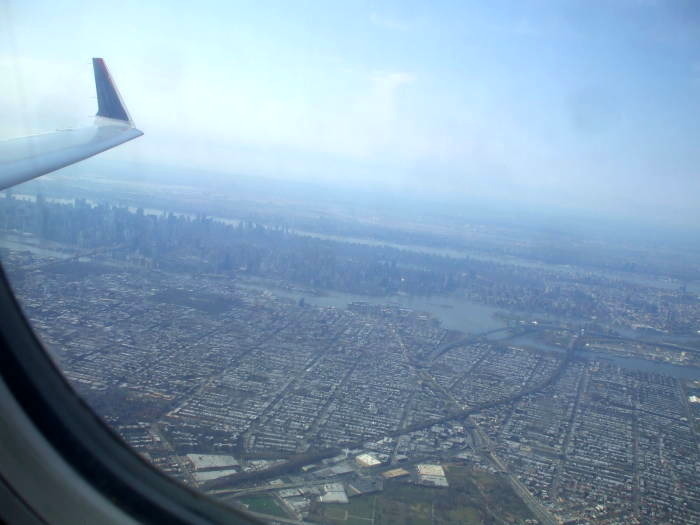 RWY 04 approach over New York harbor, Manhattan, Brooklyn, and Queens into LaGuardia on a Delta Embraer 175. Below this chart is a series of annotated pictures from a similar flight, pointing out the many landmarks you can see. That approach stayed higher and flew past the airport to its southeast; we then turned 180° and landed on runway 4/22 from the northeast. This aviation chart shows why the airspace is so busy. 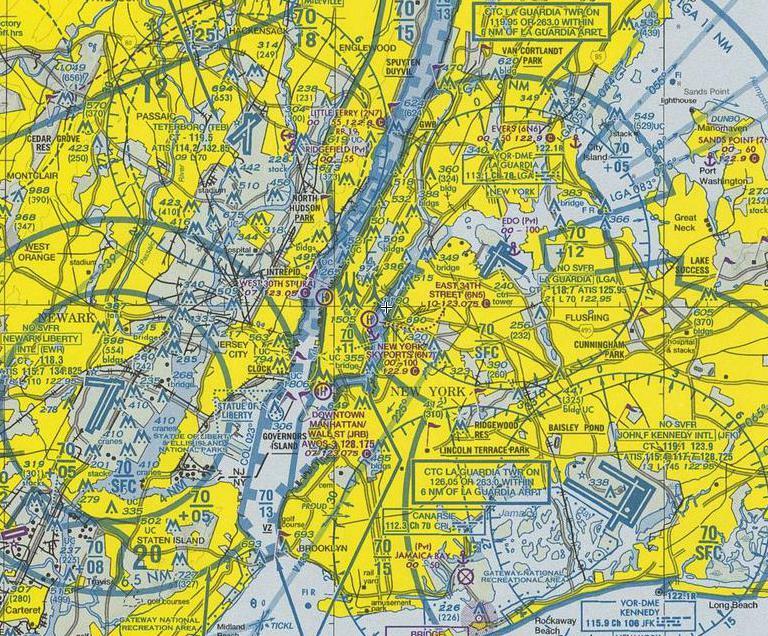 You see LaGuardia in northern Queens, JFK nearby to its southeast, three heliports (circled "H") around Manhattan, Newark Liberty International across the Hudson River and other waterways to the southwest, and Teterboro to the northwest. We are getting close. 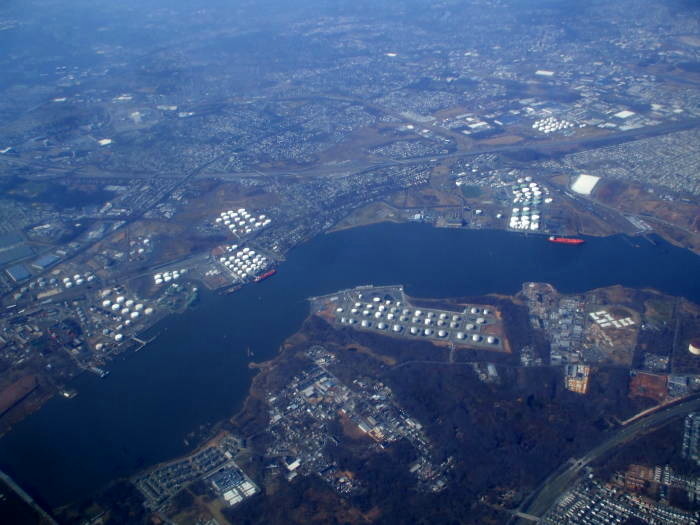 We are passing over fuel terminals on Arthur Kill between Staten Island and New Jersey, just north of Perth Amboy. We're over Staten Island, looking west over Arthur Kill and New Jersey. The oil terminal at left in the first picture is the Shell Oil terminal, at right is the Port Reading terminal for the Hess refinery. I'm not a refinery aficionado, but GoogleEarth lets me sort this out after the fact. In the second picture, we look further north along Arthur Kill toward ConocoPhillip's Bayway Refinery in Linden and Elizabeth, New Jersey. It takes in crude oil from the North Sea, Canada, and West Africa, converting it to gasoline, diesel fuel, jet fuel, and heating oil. It also includes a petrochemical plant producing lubricants and additives, and a polypropylene plant producing over 775 million pounds of polypropylene each year. We have continued to the northeast in the first picture below, leading away from Arthur Kill. 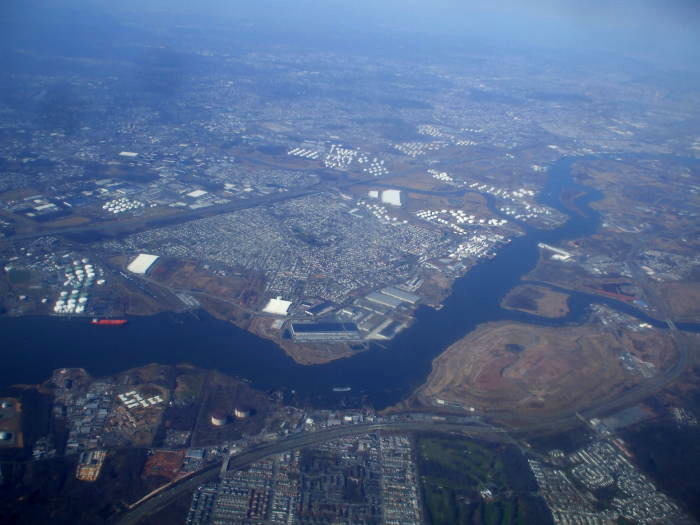 At its north end it connects into Newark Bay, the large body of water seen here. 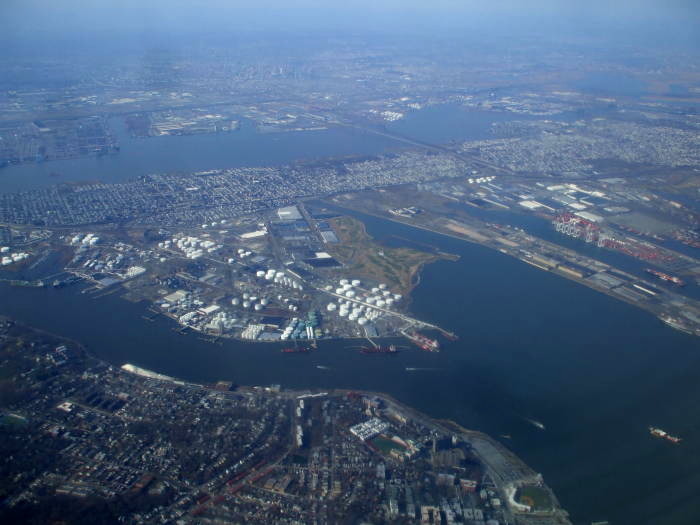 Port Newark-Elizabeth Marine Terminal is on the far side of Newark Bay. 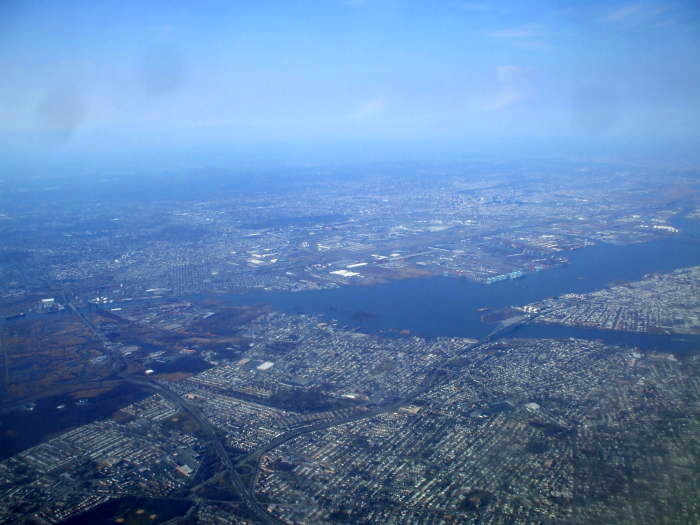 Part of it is the rectangular protrusion directly above the tip of the Newark peninsula in this view. It is the principal container ship port for goods entering and leaving northeastern North America. It is the largest container port in the eastern United States and the third largest in the country (after New Orleans and Houston, by total trade value). Above, we're crossing the north end of Staten Island. The Staten Island Ferry Terminal is just out of sight below us. 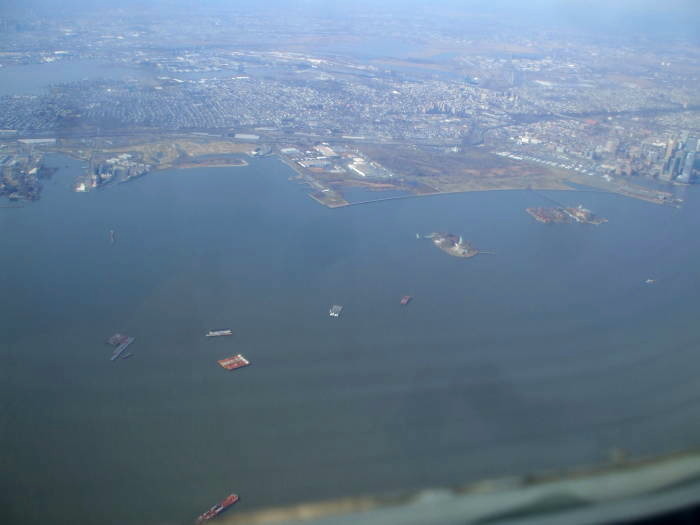 We're looking over a number of fuel terminal facilities and Bayonne, then across Newark Bay and Port Newark. To the right, Port Jersey is coming into view. This is the busy container port opening directly into New York Harbor. 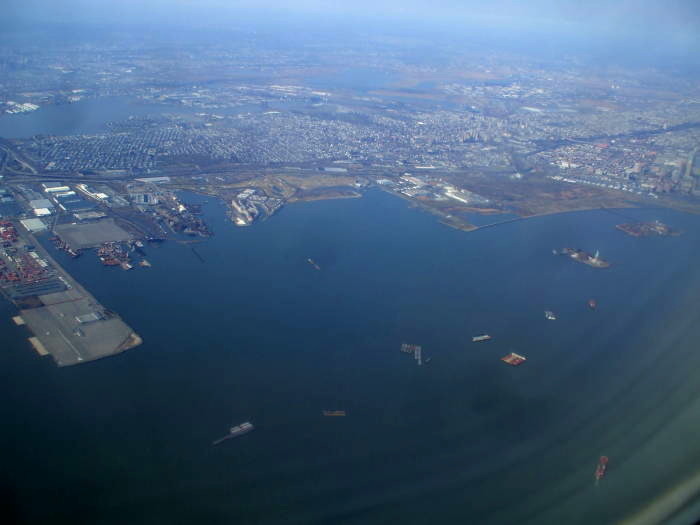 Most ships heading to and from Port Newark pass through this channel. Two long piers extend into the harbor. The northern one, at our right, is Port Jersey. The other, at our left, is MOTBY or Military Ocean Terminal at Bayonne, a U.S. military base operating from 1942 to 1990. It was opened as a U.S. Navy logistics and repair base. The Elco Naval Division produced almost 400 PT boats here. After World War II, MOTBY housed part of the Atlantic Reserve Fleet, also known as the Mothball Fleet. The facility had the largest dry dock on the East Coast. It became a U.S. Army base in 1967. Military Sealift Command moved huge amounts of cargo through here. Now there are plans to convert what's now called "The Peninsula at Bayonne Harbor" to a mixed-used community made up of residential, commercial, light industrial, and recreational areas. The Statue of Liberty and Ellis Island come into view as we cross over the center of New York Harbor. Ellis Island was the United States' busiest immigrant inspection station from 1892 to 1954. Immigration control had been handled by the state of New York until 1890, when the federal government took control. Ellis Island was the first Federal immigration station. About 1.5 million people were processed through the facility in its first five years. Then the enormous Georgia pine structure burned to the ground, destroying most of the immigration records back to 1955. The current brick structure opened in 1900. Officials had estimated an arrival rate of up to 5,000 people per day, but the facility was barely able to handle the flood arriving just before World War I. The peak year was 1907, with 1,004,756 people processed. The all-time peak day was April 17, 1907, when 11,747 people were processed through the facility. The Immigration Act of 1924 greatly restricted immigration and allowed processing at overseas embassies. The only immigrants to pass through Ellis Island for its last thirty years, 1924 through 1954, were displaced persons or war refugees. Ellis Island was then primarily used for detention and deportation processing. It was used to intern German merchant mariners and enemy aliens during World War II. It was also used for returning sick and wounded U.S. servicemen. About 12 million immigrants were processed through Ellis Island. Today, about 100 millions Americans, or about one third of the population, are descended from immigrants who passed through Ellis Island. 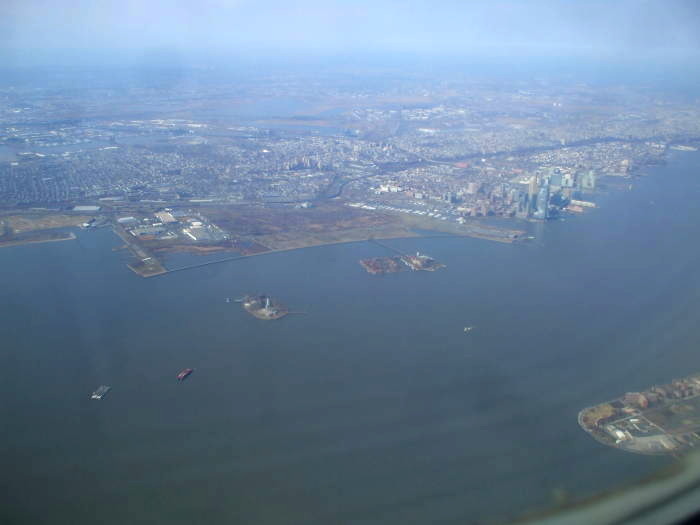 We start to see the Jersey City waterfront and Governor's Island, and we start to see the southern tip of Manhattan. Governor's Island was a U.S. Army post from 1783 to 1966, and then it was a U.S. Coast Guard installation in 1996. It's now a park, open to the public in the summer and early fall. 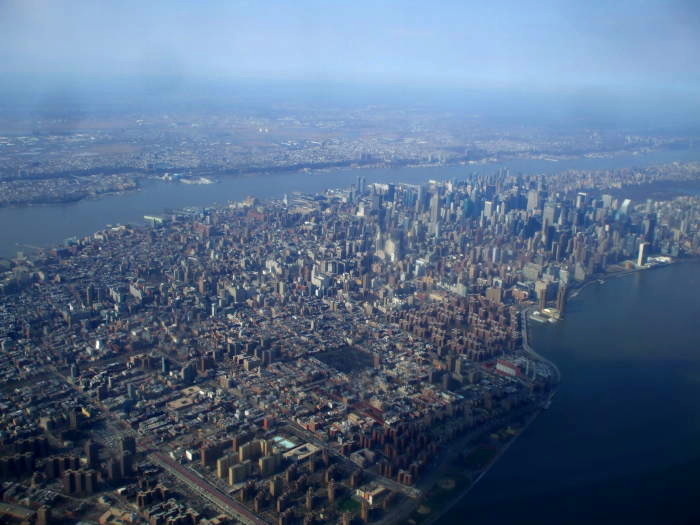 It's accessed by free ferries operating from Manhattan and Brooklyn. We can just see the Manhattan end of the Brooklyn Bridge, and beyond that we see up the Hudson shore of Manhattan as far as Midtown. Then more of Manhattan comes into view. The Brooklyn Bridge (left) and Manhattan Bridge (right) disappear under us, leading across the East River from Manhattan to Brooklyn. Beyond and to their right (north) we see the Lower East Side, Chinatown, Little Italy, Soho, the East Village, Greenwich Village, and beyond all that to Midtown and beyond. Turning slightly to our right as the East River turns to the left, we see the Manhattan ends of the Manhattan Bridge and the Williamsburg Bridge. We're looking down at the Lower East Side. Midtown is the cluster of tall buildings in the distance. Beyond Midtown we see Central Park for the first time. 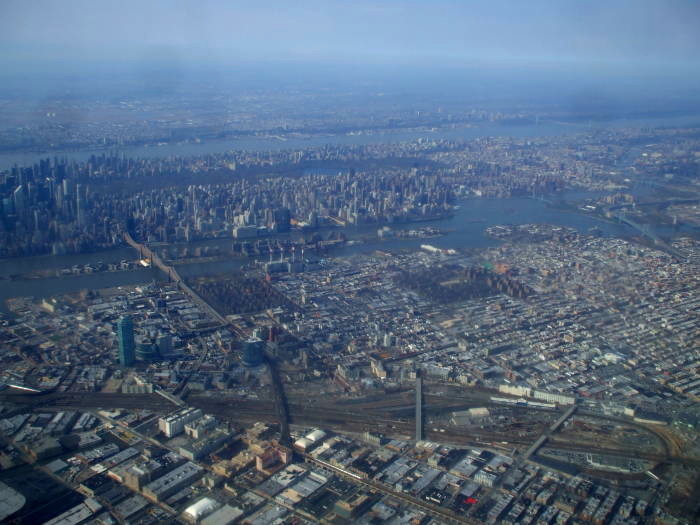 Here we can see from the Williamsburg Bridge and Delancey Street as far north as about 100th Street on the west side of Central Park. Then the Queensboro Bridge comes into view, and the Brooklyn Navy Yard is barely visible below us. We turn further to our right, and we see the Queensboro Bridge crossing the East River from Manhattan to Queens by way of Roosevelt Island. The north end of Central Park at 110th Street is clearly visible. We continue northeast across Brooklyn and over Queens. 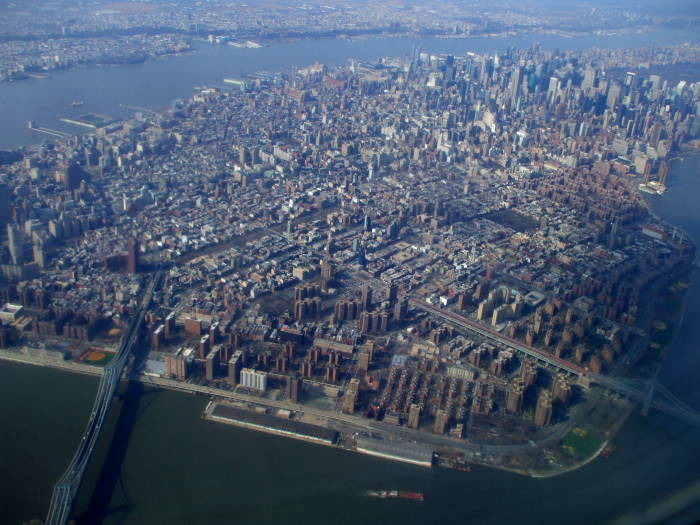 The Queensboro bridge is at left, the Triborough Bridge is at the far right, connecting Queens, Manhattan at 125th Street, and the South Bronx. We turn further to our right, to the northeast, as we prepare to fly over the airport in preparation to swing around 180° for a landing. 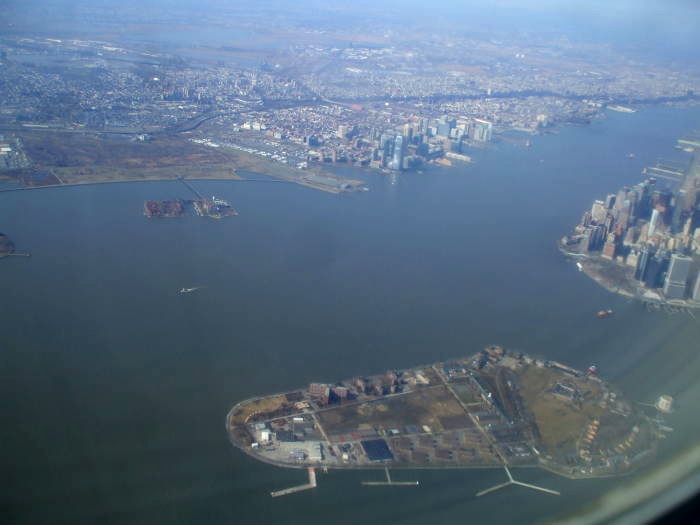 There's LaGuardia Airport, with Riker's Island and New York's main jail facility just beyond it. Speaking of indefinite imprisonment on an island, J.D. Power & Associates conducted a poll in which they found that LaGuardia has the lowest customer satisfaction of all U.S. airports. Had their poll been more ambitious, they probably could have found that it had the lowest satisfaction world-wide, or at least very nearly so. My experience is that it's not too bad of an airport to fly into. But it's an awful airport to attempt to fly out of. I would go along with Dave Barry's description of it as "the New York LaGuardia Aircraft Storage Facility." You go through a baggage check and security process that seems to have been designed for, at most, 10% of the typical load. That gets you into an extremely crowded concourse in which you have the opportunity to buy food and drinks at costs that make swanky parts of Manhattan look cheap. You will probably be loaded into your aircraft reasonably close to the expected time. Then you may sit on the tarmac for, seriously, two or three hours before finally starting the takeoff roll. But we're on our way in here, so let's not worry about that. Maybe we'll go home on Amtrak. As soon as you can, get a bus map for each borough you will be visiting. The terminal where you arrive should have them at an information booth. The bus maps are far superior to "The Map", the one subway map, as the bus maps show almost all of the streets and points of interest in a realistic scale. The subway map is rather schematic and it shows little more than the subway itself. If you can't get a bus map at the airport terminal, ask the station manager at the booth when you get to a subway station that is attended..
Buy an MTA pass. A 7-day pass is cheaper than 13 rides, so if you just make one trip out and back each day, you're ahead. The subway and buses go everywhere frequently, so you'll use it a lot. Here comes the M60 bus! 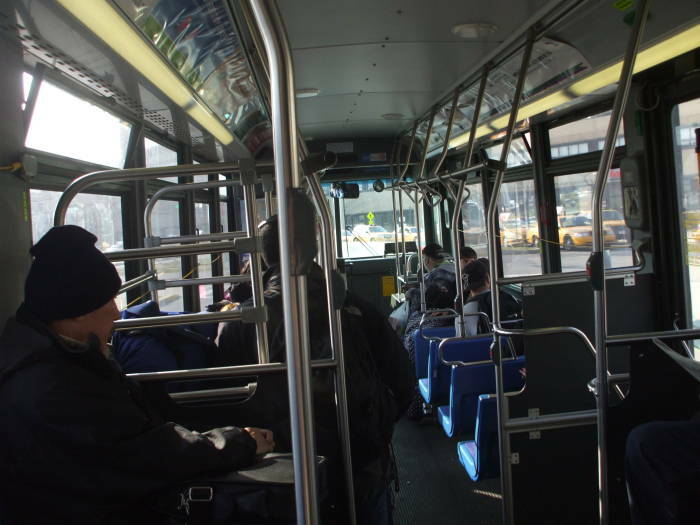 This bus runs across Queens, crosses the Triborough Bridge, then runs across 125th Street through the heart of Harlem. 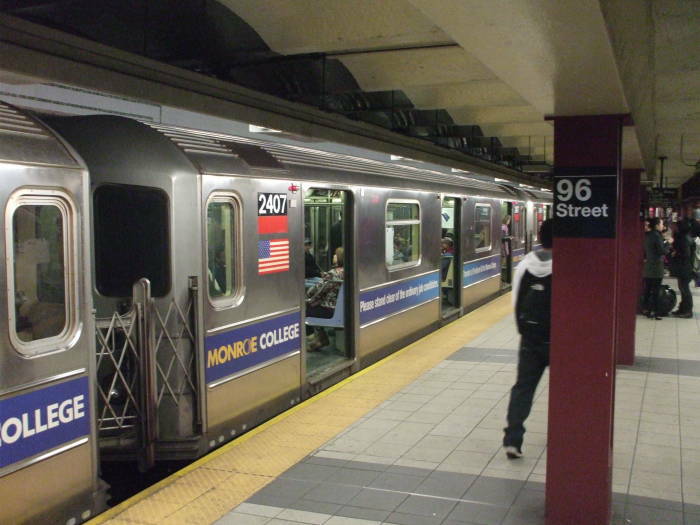 The M60 terminates at 106th Street. You can walk from there to the 103rd Street station of the #1 train. Or, if you were paying attention, you got out near the 116th or 110th Street #1 subway stations. Here I'm changing from the #1 to the #2/3 express train at the 96th Street station. I'm headed to Oude Nieuw-Amsterdam, Far Lower Manhattan. I'll stay in a corporate apartment and teach a cybersecurity or Linux course at #1 New York Plaza. Click here to see the fantastic views on my walk to work and looking over the harbor and East River from the job site. 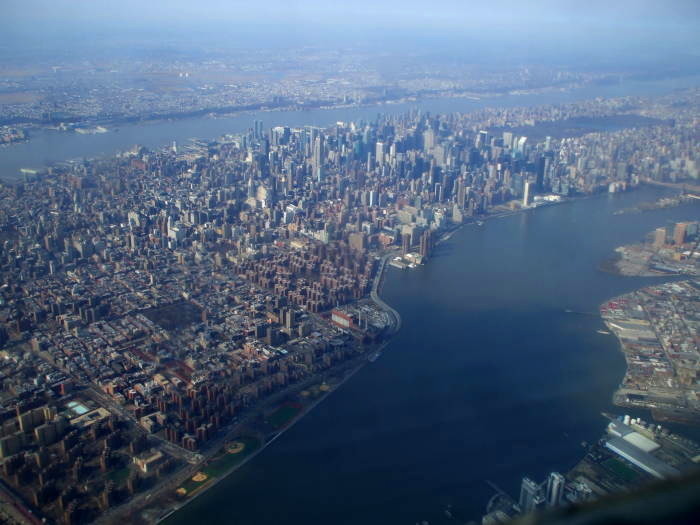 See some of my other videos below: an approach at night, up the east river during the day, and a daytime departure out of LaGuardia. Also, subway trains and the Staten Island Ferry.